As if our pocketbooks weren’t already feeling a pinch from the economic downturn, now the United States Government – and even many employers are saying “No” to cost of living increases for 2010. The Social Security Administration announced there will be no increase in benefits for January 2010 because there had been no increase in the Consumer Price Index for Urban Wage Earners and Clerical Workers, or CPI-W from the third quarter of 2008 to the third quarter of 2009. 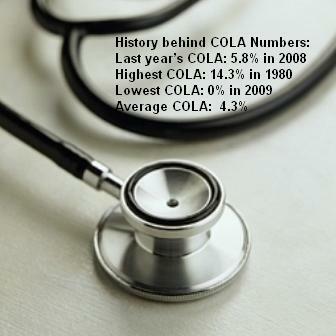 The CPI-W was developed by the Bureau of Labor Statistics and the SSA has used this index to determine COLA since 1975. 2010 marks the first year since the SSA has used the CPI-W, that there has been no increase in benefits. While there will be no COLA, millions of social security recipients will get a $250 check from Uncle Sam. At a cost of nearly $13 billion, these funds will not come from the Social Security Trust Fund which is estimated to become exhausted in 2037. In the private sector, research done by accounting firm Grant Thornton shows that 65% of companies surveyed are not giving raises for 2010. Other benefits are also getting cut in an effort to decrease overall costs to companies including health care benefits, bonuses, and matching contributions to retirement plans. While a cost of living adjustment of just 3% might not seem like much of an increase in each paycheck, for a person making $40,000 per year, the difference over one year is $1,200, or $100 per month. In a time where many are struggling to meet the cash flow needs of their current lifestyle, the lack of a cost of living adjustment is certain to be an additional burden. Since there has not been an increase in the cost of living I should not get a cost of living increase in my SS. Of course congress has come up with a “buy vote” solution. They want to send me $250. I have decided to donate any “buy vote” money to the opponent of any Senator or congressperson that votes for it. i guess he was there teling china how we may be the next Zimbabwe if the dollar keeps on path as it is.